Windows Vista, 7 and 8 include default screen savers such as Bubbles, Ribbons, Mystify and Aurora. However, when you select their Settings options on the Screen Saver Settings window there aren’t any options to select. However, with additional software you can still customize the Windows Vista/7/8 default screen savers. 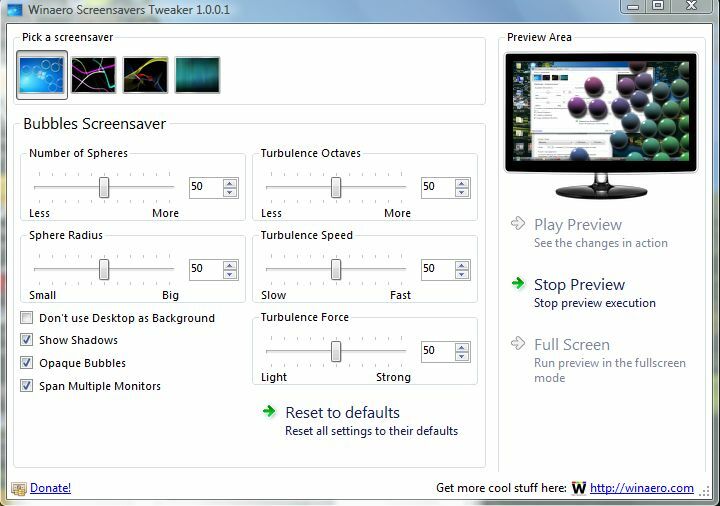 The software required is the Winaero Screensavers Tweaker which you can add to Windows Vista/7/8 from this website . When you click on the Download option, it saves as a Zip file. As such, extract the Zip folder by right-clicking it and selecting Extract All. Choose a suitable location for the folder and click Extract. Open the extracted folder, and select ScreensaversTweaker to run the software. 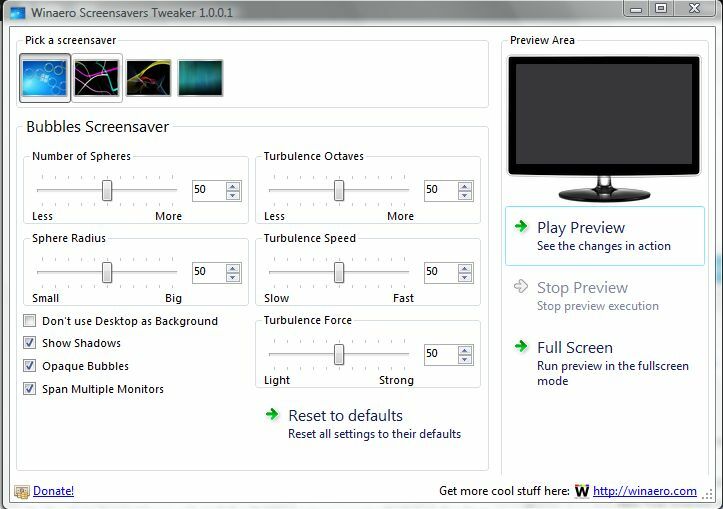 Click the screen saver thumbnails at the top of the window to flick through the default screen savers. Each have their own set of customization options with which to customize them. 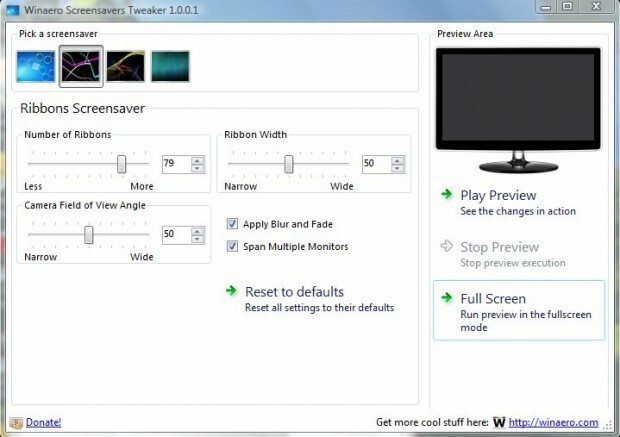 To preview the customized screen saver, click the Play Preview option. 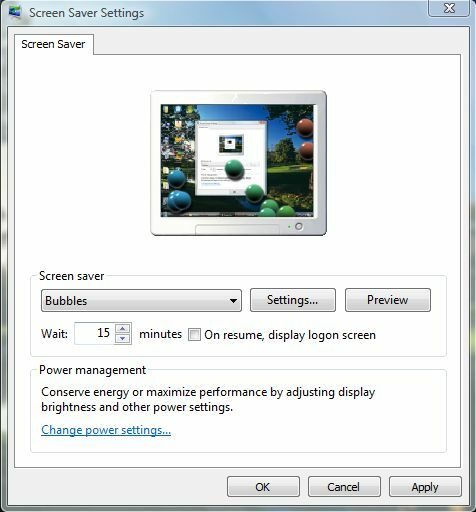 Click Reset to defaults to restore the screen savers to their default settings. In the shot above, I have selected the Bubbles screen saver which has five bars that you can drag to the left and right. You can adjust the number of bubbles included in the screen saver by dragging the Number of Spheres bar to the left and right. Drag the Sphere Radius bar left and right to decrease and increase the bubble size. There are also three Turbulence bars which you can adjust the bubble turbulence with. All are customization options that Microsoft didn’t add to the Vista Screen Saver ‘Settings’ window at least. Note that there are also check-box options such as Opaque Bubbles. 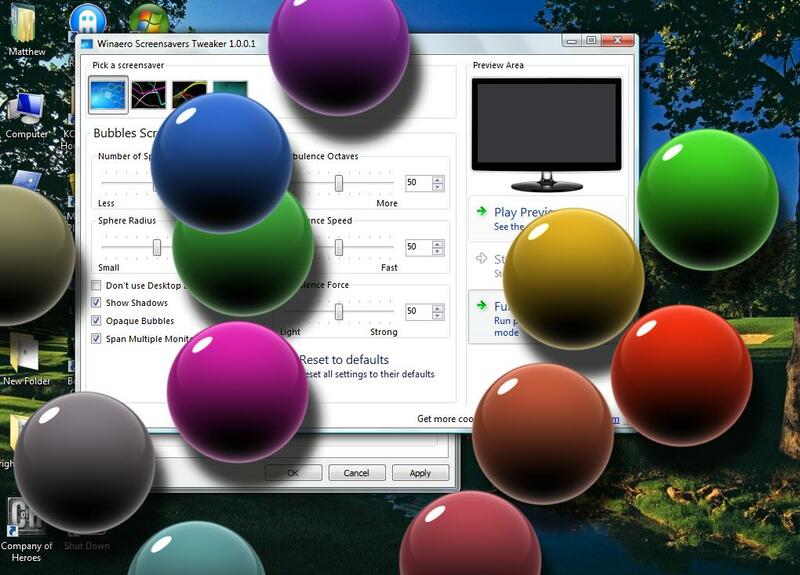 Click on the Opaque Bubbles check-box to add multicolored bubbles to the screen saver as in the shot below. When it’s not selected, the bubbles are not multicolored. The Ribbons, Aurora and Mystify screen savers also have bars with which you can adjust numbers. The Numbers of Ribbons bar decreases and increases the quantity of ribbons. You can also add more or fewer lines to the Mystify screen saver by dragging the Number of Lines bar to the left and right. Aurora’s Number of Layers bar adjusts the layer numbers. When you have made the required changes, open the Windows Vista, 7 or 8 screen saver window. Then choose one of the default screen savers and select Preview. You should find that the preview matches the Winaero software’s screen saver preview. Click Apply and OK to make it your customized screen saver. Winaero Screensavers Tweaker has plenty of options to customize the default screen savers. You can transform the screen savers with the software!